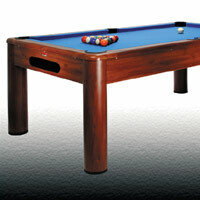 BCE / RILEY are the leading supplier of snooker and pool tables in Europe. BCE / RILEY has been making cues and pool tables for more than 20 years. The BCE / RILEY name was built on quality and we still believe to this day quality is the most important factor our customers look for, coupled with value for money, BCE / RILEY are truly unbeatable. The company stands behind all its products, and we are the only company in the industry to offer one year warranties on all two and three piece cues and our Table Sport products. BCE / RILEY lead, the rest follow in all aspects, from innovative cue design technology to our unique one year cue warranty. 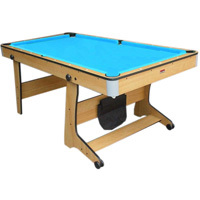 We are able to offer you a great deal on this superb range of pool tables made by BCE Ltd. We can supply any product offered by BCE Ltd to all our visitors. Our 5ft Le Club pool table. This seems to be our most popular sized indoor table. At 5ft it seems to be just the right size to fit in that youngsters bedroom. Black metal folding leg system with independent leg levellers. Features a ball return system. Comes complete with set of 1 7/8 in pool balls, 2 x cues, a triangle and some chalk. All you need to start you off ! 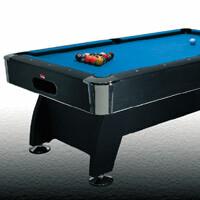 Just look at this stylish range of pool tables. If you have room for a 6ft table in your home and want something that is in keeping with your furniture, then this could well be the table for you. With its dark wood look and classic style this really is a nice looking table. It comes complete with set of 2" pool balls, 2 x cues, a triangle, a brush and some chalk. All you need to start you off ! Do you want a table just like the one you play on down the pub ? Well this is it. All that's missing is the coin slot and the smoky room. This is our most "chunky" looking table and just looks awesome with its black and chrome finish. It has the ball return system and comes complete with set of 2 1/4" pool balls, 2 x cues, a triangle, a brush and some chalk. All you need to start you off !